The tour route will never sound the same again! We said goodbye to vocal Wiley coyote just as the autumnal equinox arrived. Wiley was born in 1999. At the beginning of his life, Wiley was kept as a pet. When his owners discovered he was too difficult to handle, they asked Southwest Wildlife to take him. 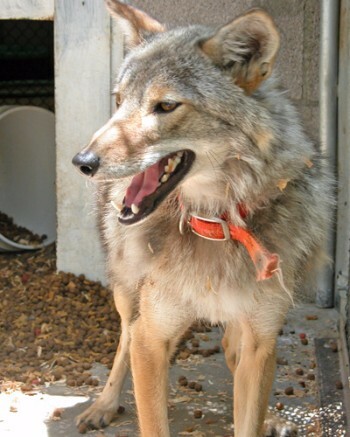 The former pet coyote came to our sanctuary with a red collar and a bad attitude. According to his previous owners, he didn't like people. For most of his life, entering Wiley's enclosure required special care. There were only a few select volunteers he would allow to enter his "territory" to feed and clean. Fortunately, over the years, he mellowed and became more accepting of those he would tolerate in his home. 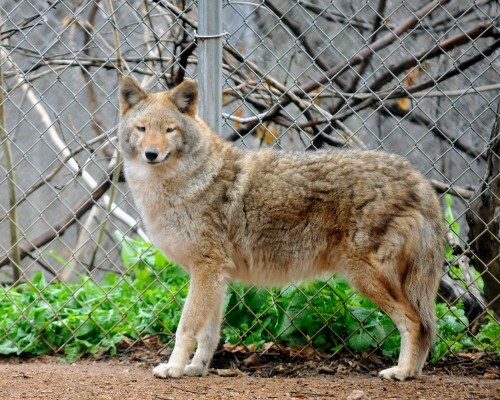 Wiley was always a very talkative coyote and often could be heard snarling, yipping and barking for visitors during tours. Wiley's health has been declining for a while. His last years were made more comfortable with excellent medical care for as long as that was helpful. His later life was also enriched by a lovely young female coyote named Jean Harlow. She kept him on his toes! Harlow will miss him, as we all will! He was an original! Happy trails Wiley-man!